Many study participants expressed that learning about their culture was an important part of survival as an Aboriginal person in today’s Aboriginal society. Learning from one’s mistakes was considered important for many participants in this study. This was not surprising as learning is considered a traditional cultural principle especially for children and young adults. Traditionally, such individuals were permitted to make mistakes, at times more than once. The expectation was that they would learn and not make the same mistake again. Of course, this was important for their survival. Some Aboriginal people saw learning as the ability to gather knowledge and information about their culture from Aboriginal elders and leaders. This is not an easy task and individuals soon learn that there are cultural protocols and processes that must be adhered to before any cultural information is passed on. Individuals must show humility and demonstrate that they have respect for themselves and others, especially their elders. So learning, in regard to gaining knowledge and information about one’s culture is, for some individuals, a major part of empowerment and self-determination. Although some study participants shared their personal experiences of learning, the majority spoke of the importance of learning about their culture from community elders and leaders. Many expressed a great deal of pride in their ability to do so. Study participants who were removed from their family from a young age or who were never taught important cultural practices, expressed that learning about their culture was an important part of survival as an Aboriginal person in today’s Aboriginal society. Aboriginal cultural knowledge and practices must be learned, in order for them to be retained and passed on to future generations. “Me and my kids we always identified as Murries, that’s how I brung them up. They also had a lot to do with mum and dad. My kids were taught about our Murrie culture, yes the Murrie way. They know some of the language, how to track small animals. How to make a damper? And cook it in the ground. They can go out bush and gather some bush foods. 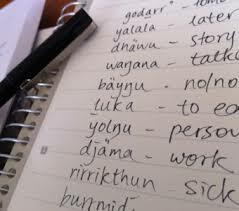 Learning for many Aboriginal people is a way of surviving. Most participants saw the importance of learning about their culture. Others saw the benefits of learning from personal experience, while others established learning as a means of empowerment. Some believed they learned to be resilient to help forge a better way of life for themselves and their people.